More information is available on the "Writing Opportunities" bulletin board outside the dean's office. No entry fee is required. Applicants can submit an unlimited number of entries each month. Winning submissions will be published according to specified dates. Entries will be judged and the top two to four articles chosen will be published on the NLR website. Each winning article will be displayed accompanied by the student’s photo, biography, contact information, law school logo, and any copyright disclosure. All winning articles will remain in the NLR database for two years (subject to earlier removal upon request of the law school). Open to all full or part-time law school students, undergraduate or graduate. 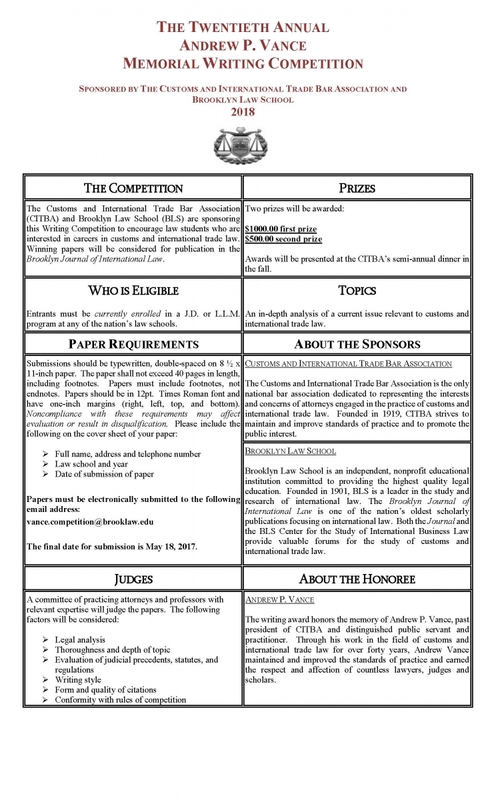 Papers on any federal or state tax-related topic may be submitted in accordance with the Competition Rules (viewable at www.tannenwald.org). For more information contact Nancy Abramowitz at 202-274-4164 or nabramo@wcl.american.edu.